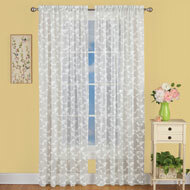 This sheer curtain panel is the perfect way to add style to your home. 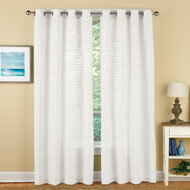 With a sheer white linenlike background, the lovely panel offers privacy while letting the light shine through. 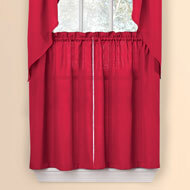 Grommet top for easy hanging. Panels sold individually. Machine wash. Polyester and metal; imported. Color available in Blue, Sage or Taupe. 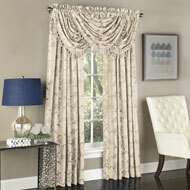 Size available in 63"L x 54"W or 84"L x 54"W.
Add designer style to your windows with these beautiful paisley drapes. 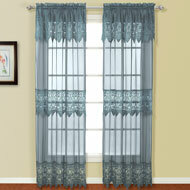 They feature a white paisley design atop your choice of a blue, sage or sand background. Rod pocket tops. Panels available in two lengths. Machine wash. Polyester; imported. Color available in Sand, Blue or Sage. 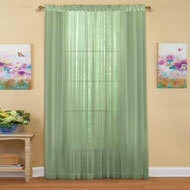 Size available in 50"W x 63"L or 50"W x 84"L.
This beautiful sheer curtain panel features a solid color background embroidered with an elegant floral design. The lovely fabric lets light through while offering a bit of privacy. 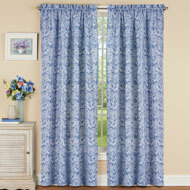 Each panel has a rod pocket top for easy hanging (panels sold individually). Available in two colors and lengths. Machine wash Polyester; imported. Colors available in Sage or White. 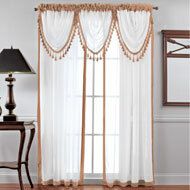 Sizes available in 63"L x 54"W or 84"L x 54"W.
Beautiful panel features alternating macramé and voile with an elegant pointed hem, while the attached valance provides the finishing touch. Machine wash. Polyester; imported. 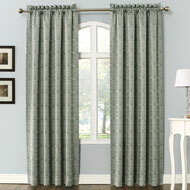 1 panel measures 52"W x 84"L. Each panel sold separately. This item ships from a separate warehouse and will arrive in a separate package. Available in White, Natural, Blue or Sage. 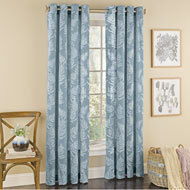 With a stylish fern design, this beautiful curtain panel will give your windows instant designer appeal. 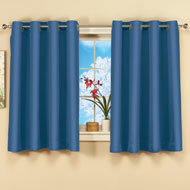 Available in three solid colors with a soft white pattern, each curtain panel features semisheer woven linenlike fabric and grommets at the top for easy hanging. Available in two lengths. Machine wash. Panels sold individually. Polyester; imported. Choose: Sage, Blue, or Coral. Available in: 63"L x 54"W or 84"L x 54"W.
These elegant roomdarkening panels provide insulation from heat and cold, reduce outside noise and add color and style to your windows. 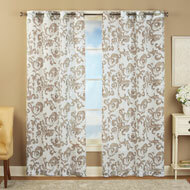 Panels feature a beautiful damask pattern and a rod pocket top for easy hanging. Available in 3 colors and 2 lengths. Each panel sold separately. Machine wash. Polyester; imported. Choose: Navy, Sage or Steel. Available in 63"L x 54"W or 84"L x 54"W.
A lovely horizontal pleated design and a linenlike texture make these sheer curtain panels a beautiful way to dress your windows. Light shines through while the fabric offers a bit of privacy. 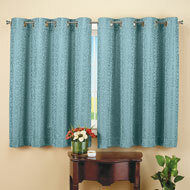 Available in 3 versatile colors and two lengths, the panels have grommets at the top for easy hanging. Panels sold individually. Machine wash. Polyester; imported. Colors available in White, Blue or Sage. Sizes available in 63"L x 52"W or 84"L x 52"W.
Beautifully sheer fabric gathered in soft ruffles give volume and texture to this elegant curtain set. The overlapping layers swag back with ties for a lovely effect, while the ruffled edges and top border add fullness. Rod pocket top. 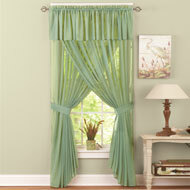 Double curtain rod not required. Machine wash. Polyester; imported. 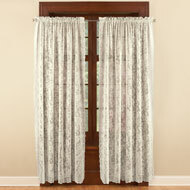 Curtains 84"L x 100"W, fits windows 40"90"W. Tie backs are 24" x 6". Colors available in Blue, Cream, Sage or White. These insulated curtain panels with a beautiful toneontone lattice design protect from heat and cold, block out light and helps reduce noise. 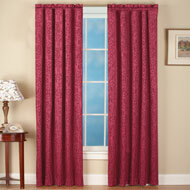 Panels are sold individually and are available in 2 lengths. Each item has a rod pocket top for easy hanging. Machine wash. Polyester; imported. 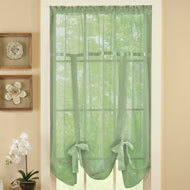 Colors available in Sage, Taupe or Blue. Sizes available in 63" (50"W x 63"L) or 84" (50"W x 84"L). 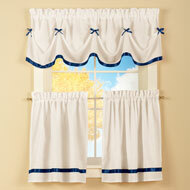 Made of satiny polyester, the two panels have an attached valance. Matching tiebacks included. Rod pocket design. 54"W x 84"L. Imported. Machine wash. 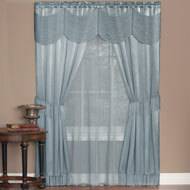 Fits windows 36" 42"W. Specify: Blue, Pink, Lilac, Mocha, Burgundy, Sage, Chocolate, Navy, or Grey. 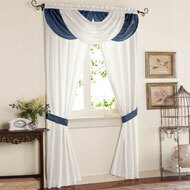 Now you can have a designerlook quickly and easily with this elegant curtain set. 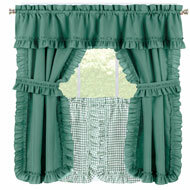 Set includes a valance and two panels with tie backs. The sheer fabric lets light in, while also adding a bit of privacy. Rod pocket tops make hanging easy. 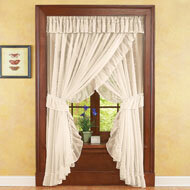 Double curtain rod not required. Machine wash. Polyester; imported. 84"L x 89"W. Color available in Sage, Cream, and White. 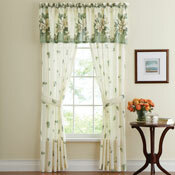 These lovely swags will instantly dress your windows in designer style. The solid fabric features a lovely ribbed texture. Rod pocket tops make hanging easy. Set of 2 swags available in your choice of 3 colors. Machine wash. Polyester; imported. 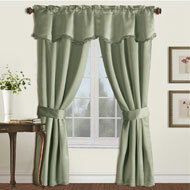 Each swag is 24"W x 54"L. Colors available in Red, Hunter Green, Cream, White, Navy or Sage. This beautiful sheer shade makes it easy to get a designerlook for less! 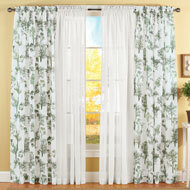 Sheer fabric lets the light in while adding privacy, and rod pocket tops make hanging easy. Machine wash. Polyester; imported. Adjust the length with the satin ribbon ties included.  64"L x 58"W. Colors available in Sage, White, Taupe, Blue, Cream, Lilac or Burgundy. 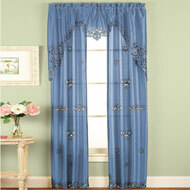 This lovely lace drapery features beautiful floral and leaf patterns with elegant scalloped edges. Each piece has a rod pocket at the top for easy hanging. Available in 4 lovely colors. Panels are available in 2 lengths. Machine wash. Polyester; imported. Color available in Blue, Burgundy, Sage or Natural. Size available in 63"L x 56"W or 84"L x 56"W.
These elegant damask curtains drape beautifully and are 100% blackout; making them energy efficient, keeping the cold out in the winter and heat out in the summer. 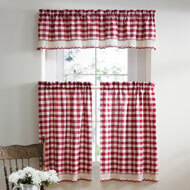 Pair them with the matching valance (A2208). Polyester; imported. This item ships from a separate warehouse and will arrive in a separate package. Colors available in Brown, Sage and Tan. Sizes available in 52"W x 63"L ea. or 52"W x 84"L ea. Give your windows a designer look. 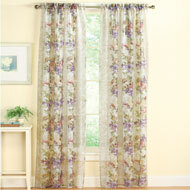 A beautiful toneontone vine and floral pattern is featured on luxurious jacquard fabric. Rod pocket tops for easy hanging. Panels available in 2 lengths. 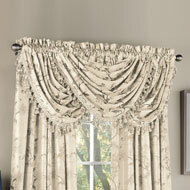 Valance features tassels finishing the bottom edge. 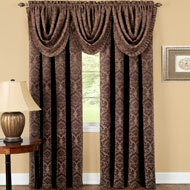 Multiple valances can be used for a luxurious effect (3 valances pictured). Machine wash. Polyester; imported. 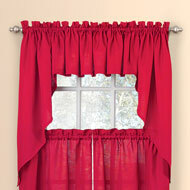 Valance and panels sold separately. Choose: Cocoa, Ivory or Sage. 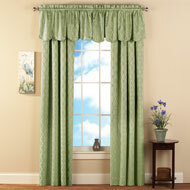 Available in Waterfall Valance.